The actual concept of the bungalow house developed in India, it was descriptive of a “house in the Bengal style.” But in the 40’s and 50’s the bungalow became the archetypal American dwelling, a symbol of the American dream. The word “bungalow” conjures up all things cute, cozy and compact. The Bungalow Cushion Deep Seating Set by Woodard, however, has sophisticated, upscale styling and, while it would suit a good old American bungalow, it would also be just as fabulous in a “house in the Bengal style.” Not only is the Bungalow Deep Cushion Seating Set gorgeous, it is also made by a company with 140 years of patio furniture manufacturing experience. Woodard’s expertise is evident, from the premium aluminum alloy used to fashion the frames to the quality electrostatically applied powder-coat finish. Woodard’s cushions are just as excellent; they are tailored to fit, are weather-friendly, and are the quintessence of comfort. Woodard is a designer’s dream with their exclusive frame finishes and wide array of fabric choices. Choose your favorites and create a statement for your little bungalow. 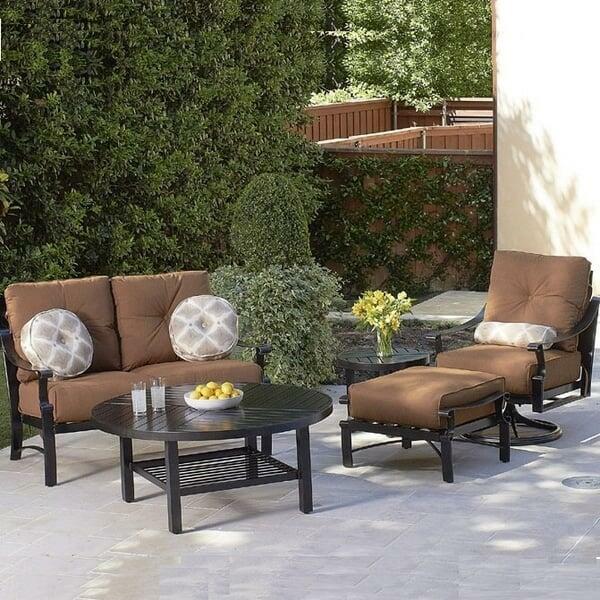 The Bungalow Cushion Deep Seating Set is more than a collection of patio furniture; it’s art.